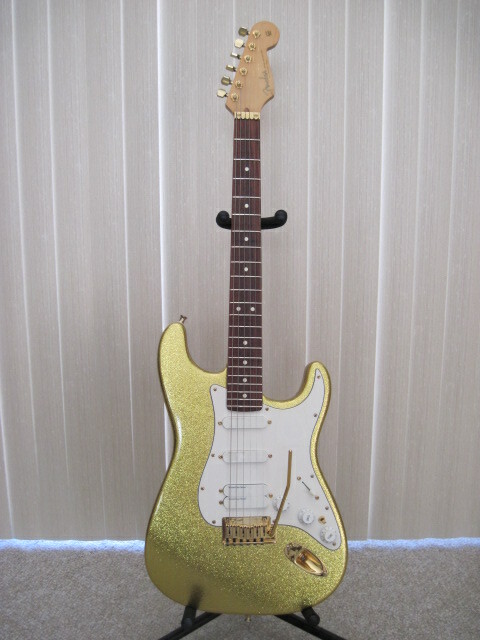 1992 Fender Stratocaster Plus Custom Shop Gold Metal Flake. All Gold Hardware. Gold Lace Sensors In Neck And Middle And Blue Dually In Bridge Plus TBX Tone Control And 3 Way Mini Toggle To Select Coil Closest To The Bridge / Both Coils/And Coil Away From The Bridge. I am glad you have an instrument like this. This is pretty much like an 1990 Strat Ultra I have. The only differences are the gold hardware and the absence of an ebony board. I have a blue sensor in the neck and a red dually in the bridge for the select Lace Sensors; the middle remains a gold sensor I like it but I can't afford it since I retired. .
Hey Scott i know its off topic with this guitar,but i watched your vid on the hello kitty squier,i managed to grab one still in plastic for 90 bucks,its dated 2005 and its the black one,quick few questions for ya.is the 05 dated the first year?,i thought 06 was?,and does the value of the black model differ from the pink one? thnx! Yeah, I was glad to change my mind and pull this one away from the sale. It is just a perfect axe for sure!